The state of Colorado is the 8th most extensive and the 22nd most populous in the U.S. with Denver as its capital and largest city. Known for its snowy mountains, arid plains, craft beer and microbreweries, high altitude, relatively great living standards and cost, and fit population, Colorado has consistently seemed like a pleasant state. A year ago Governor John Hickenlooper launched the Making Colorado initiative to build a brand for the state. In charge of the new logo was a team of 12 Coloradan designers and writers, who created three options for people to vote on and last week, at the Colorado Innovation Network Summit, Hickenlooper introduced the new logo designed by Evan Hecox. The creative phase of the project. Like Colorado itself, our new logo combines the familiar with the unexpected. 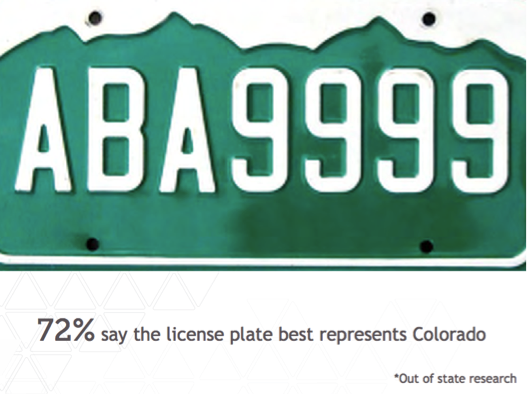 It draws clear influence from our world-famous mountains and beloved license plate. 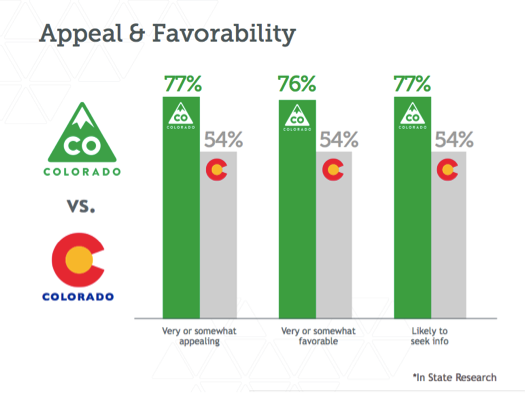 But its shape, an upward facing arrow with rounded corners, also serves as a symbol of Colorado’s momentum and a reminder of its friendly and approachable attitude. While our new identity certainly isn’t everything Colorado is, it will serve as a constant and consistent reminder of everything our spectacular state can be. 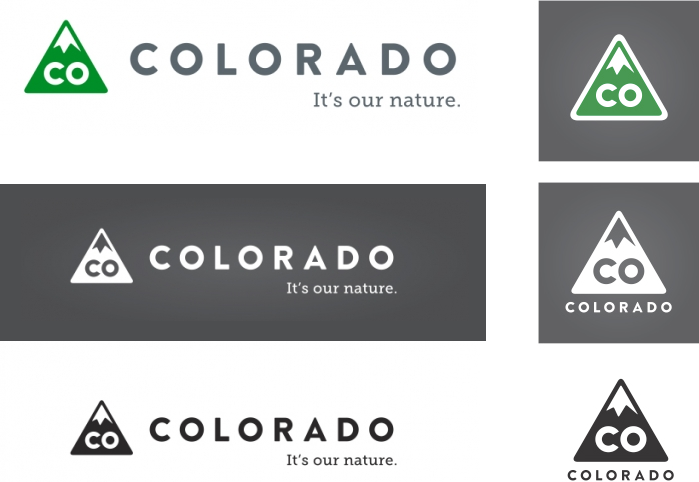 “It’s our nature” is at the heart of Colorado’s new brand. Serving as the tagline, these three words symbolize the duality of our state—awe-inspiring scenery and life-loving people. It connects adventure with entrepreneurship, beauty with happiness and fresh air with creativity. Logo introduction video. Explanation of logo begins at the 1:15 mark. With destination logos it’s always beneficial to be a step (or state) removed, since the locals, by default, tend to reject whatever logo is introduced, as has been the case here. (If you think Brand New commenters are snarky and/or mean, just read this 500+ comment thread on Facebook, coming from Colorado locals). The opening image I used isn’t quite accurate as there wasn’t a true “before” logo, but the “C” in the flag was commonly used on its own and is the closest thing to an identifying mark for the state. The new logo makes an immediate impact: it’s simple, easy to remember, bold, and it says Colorado right away. Does it encompass all the nuances of the state? No. No single destination logo does that. A lot of the complaints are that the logo looks like a road sign — well, that’s perfect, isn’t it? Driving through the beautiful scenery of Colorado is an experience worth communicating. It’s not an outstanding logo and considering the long-haul of the project and the amount of people (designers and non-designers alike) involved it’s commendable that something decent and usable came out. Thanks to Charlie Guese for the tip.